There's nothing rotten with this thick, '90s-style fuzz. With just a whiff of op-amp fuzz left after mutilating this muff, you're left with something that's dreamy in bass and gain range. What's needed for that rotten-to-the-core sound is a thick dose of bass, gain for days, and a perfectly scooped midrange that recalls the 1990s on speed dial. 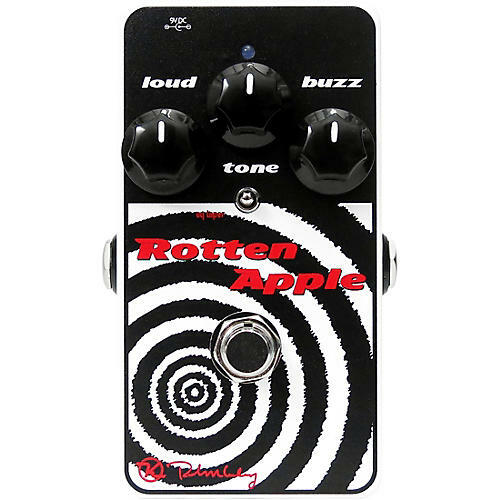 The gain of the Keeley Rotten Apple fuzz pedal has an amazing range of gain on tap, and it is sensitive to your guitar and strumming. So even though it pumps and smashes through your speaker cab, you can roll your guitar back to float like a butterfly. The Tone control gives you everything from submerged stoner rock sludge to highs that claw at your speakers.